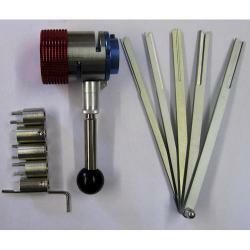 A well engineered tool with 5 rake/overlifters for Mercedes, Saab2, BMW2, BMW4 and VW laser key locks. The ingenious tension tool contains a built in plug-spinner ready to use once the lock has been picked. The set comes with 5 tension tools, the body to use these and the 5 picks.